Cancun Mexico may be a young city, but it's sure getting overcrowded near accommodation along the best beaches of Mexico that only 30 years ago were a deserted sand spit. The good news is, you can still find pure white beaches near Cancun without too many people, despite the brash and always colourful metropolis that's sprung up in this Mexican best beach resort location. Cancun is a long, narrow island connected to the mainland by two bridges, with everything you're looking for from five-star luxury resort accommodation near Cancun beach, to small romantic islands. The beauty of Cancun is that all types of people are attracted by one thing - the beautiful white sandy Cancun beaches. Cancun is Mexico's most popular resort town, gently kissed by the warm crystal waters of the Caribbean Sea. Most beach resort and beach hotel accommodation is located in or near The Hotel Zone, which is big and brash and right near Cancun beach. The only main thoroughfare through town is Kukulcan Boulevard with all the accommodation near it, but if you want to see how the locals live and keep some weight in your wallet, go to nearby "Cancun Centro", where you can experience the real Mexican way of life. Cancun Centro is where most of the Mexican workers reside, and it's a happy, vibrant downtown area where you'll be immersed in that wonderful Latin way of life. Arriba! For our best beach holiday in Cancun. Try a rustic, luxury hideaway called the "Maroma Resort and Spa" on one of Cancun's beautiful beaches a little away from the crowded central beach resort area. Maroma Resort used to be a 500 acre coconut plantation and is built in the traditional Mexican hacienda style, with smiling attentive staff who will happily cater to your every whim. The unspoiled beach in front of Maroma Resort is really one of the best beaches in the world. You just won't want to leave. Fine, white sandy Cancun beaches with swaying palms and warm sunshine guaranteed to de-stress almost anyone within a day. This yummy Yucatan coastline also has the world's second longest barrier reef with outstanding snorkelling and scuba diving near the Yucatan peninsula. For a daytrip, take a boat from near your beachfront accommodation to one of the many small deserted islands near the Yucatan coast, or take a tour to the many impressive nearby Mayan ruins from centuries ago. 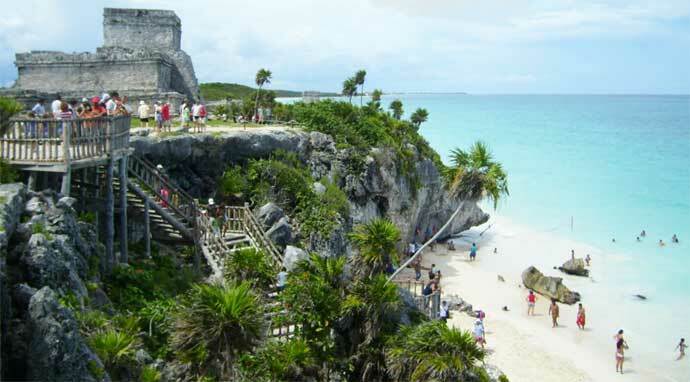 < Ancient accommodation near Cancun beaches. And what's so surreal about Cancun is that just near Cancun beaches is a small bullring downtown, in Plaza de Toros. It sounds strange to go from the laidback "maniana" atmosphere on the beach to a bullfight near Cancun beach, which takes place every Wednesday afternoon. No bull! This is such a diverse beach destination that you can live a Robinson Crusoe way of life without even crossing paths with the other frenetic Mexican lifestyles. 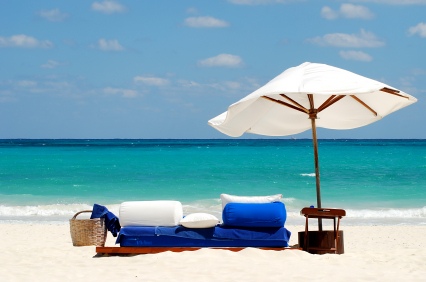 Cancun is one of the world's best beach holidays on what's known as the "Mayan Riviera". Book the best holiday resort hotel accommodation near Cancun beaches, Mexico.